Kentucky football finished up their spring game as the blue team dismantled the white team in a promising 64-10 win. The blue team was, of course, the starting bunch, as Terry Wilson and the offense looked much more explosive scoring 64 points. 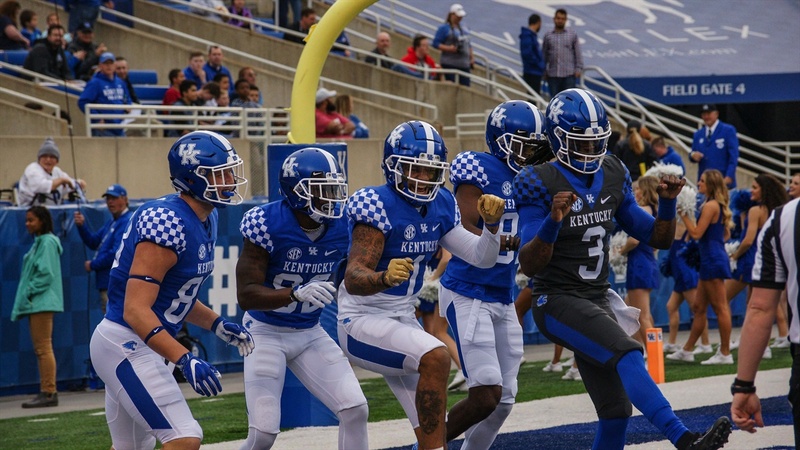 The defense was overshadowed by the offense in Kroger field, but the starting defense played well, only allowing one touchdown by the second string offense. Kentucky’s team is going to look much different without Josh Allen, Benny Snell, Mike Edwards, etc. Here are my six takeaways from the spring game and what to expect when Kentucky takes the field in the fall. Last season, Wilson got his feet wet as an SEC quarterback, and at many times was believed to be what held the offense back. With a guy like Benny Snell as a running back, people might come to find out how hard it is to get into a rhythm as a quarterback when you are handing it off to a guy like Snell more times than not. Wilson had 11 touchdowns last season and eight interceptions, which he will have to be much better than if Kentucky hopes to continue their success. On only seven yards per pass attempt, Wilson and the offense lacked explosive plays all last season. However, that wasn’t the case in the spring game, as Wilson threw for 191 yards on 10-for-12 passing; he finished with two touchdowns and zero interceptions. Yes, that is around 19 yards per completion, which is much more explosive than last season. Wilson looked comfortable, and he hit deep passes that he failed to hit a majority of last season, including a 42-yarder to Lynn Bowden for a score and a 60-yarder to Isaiah Epps. Receivers got more separation and made some impressive catches, while Wilson looked comfortable in the pocket. Yes, it was just a spring game, and pressure isn’t present in a game like that. With that said, Wilson has already faced pressure, from being in the Swamp or in College Station or in the Citrus Bowl against Penn State. The fact of the matter is that Wilson was hitting routes he hadn't consistently hit all last season. With the change of the offensive playstyle, it will benefit Wilson’s game much more. When was the last time Kentucky football could say this statement or have they ever? In my eyes, the receivers were the most impressive position group on the field in the spring game, as they easily looked the most improved. Here is how I would put Kentucky’s two-deep receiving corps. Kentucky now has a lot of different weapons to throw at secondaries. Bowden is clearly the star of the group, a guy who can do it all and he might become amongst the best in the nation in 2019. Epps has shown he can be a deep threat, and Ali is a great route runner that can get separation. Wagner is the big guy for critical fade routes and drawing PI’s, Hayes is a true quick, speedy slot that has potential or Thomas who has experience in the slot. And then there is Bryce Oliver, a name that has been mentioned a lot all spring. Oliver was in white for a majority of the game, and he gave Cedrick Dort all he could handle. Oliver hauled in a couple of very impressive catches and made plays the whole time. The redshirt freshman finished with eight catches, 105 yards, and a touchdown. Kentucky finally seems to have some playmakers on the outside, and the group seems to have a good chip on their shoulder heading into 2019. No Benny Snell, no problem... Seriously. AJ Rose is a big play back, and what kinda felt like a slow day for him truly was not, as he finished with 11 carries, 86 yards, and three touchdowns. Rose averaged seven yards per attempt, which is probably around what he will do in the fall. Rose is the premier back and will turn some heads with his speed and versatility in the fall. Kavosiey Smoke also turned some heads, finishing with five carries for 132 yards and a pair of touchdowns. He exploded through the middle for an 87-yard score, which was reminiscent of the 37-yarder he popped off against Louisville last season. Smoke seems to have a lot of power, but he has already shown off his speed as well. I believe Smoke will surface as the number two back in the fall. That is not even to mention Chris Rodriguez, who had a nice outing in the spring game too. He had 17 carries for 71 yards, which is a solid four yards per attempt. Rodriguez is a true power back that looks an awful lot like Snell when he runs. He can come up big in short yardage situations. On top of all of that, the offensive line created some glaring holes for the backs. Coach John Schlarman is becoming one of the best oline coaches in the country, as he has consistently put together great offensive lines for Kentucky. It was great to see Landon Young back out there, and the experience is matched with a lot of young talent. Many are expecting a drop off in the run game without Snell, but I would not. Many people are just talking about one side of the football after the Wildcats spring game, and a 64-point outing after losing a lot of studs defensively, that is expected. However, Kentucky’s front seven is massive. It looks like an SEC defense, which is what it looked like a season ago. With that said, Kentucky might be even more physically imposing this season in the front seven. The defensive line consists of guys like Calvin Taylor Jr., who stands at 6-foot-9 and weighs 310 pounds. Then you got Quinton Bohanna at nose tackle, who is 6-foot-4, 361 pounds. And you also have Josh Paschal, at 6-foot-3, 284 pounds. Their backups, TJ Carter, Marquan McCall, and Kordell Looney are all above 6’3, 280 as well. Kentucky is big up front, and they have some great experience. Bohanna and Taylor are poised for a big time season. And then you have the linebackers, which are all physically imposing outside of Deandre Square. But Square showed us last season as a true freshman that he can play SEC football. Kentucky’s front seven clearly lost some firepower in Josh Allen, but they have some impressive young guys that can become big time playmakers. Jordan Wright definitely stood out in the spring game. Boogie Watson has great experience and could become that firepower off the edge. Kash Daniel is Kash Daniel, and after promising true freshman seasons, Chris Oats and Square seem ready to make a massive step this season. Kentucky should be fine in the front seven. But after losing five seniors in the secondary, all of which will likely be draft in the 2019 NFL Draft, the Wildcats will need inexperience to play well. With that said, I liked what I saw out of the starting secondary. Davonte Robinson and Jordan Griffin both have a lot of experience, and I wouldn’t expect much drop off from Mike Edwards and Darius West departing. Behind them you also have Tyrell Ajian who had some experience last season as well. Depending on how big of a step Yusuf Corker can take and if true freshman Moses Douglass can become a valuable piece will determine how much depth the Wildcats have at safety. Corner, however, could be a different story. After losing Lonnie Johnson, Derrick Baity, and Chris Westry, the Wildcats will be playing a lot of guys that have never played valuable minutes in SEC football. I did like what I saw out of the JuCo product Brandin Echols on his film heading in, and he proved that in the spring game as well. Echols is a physical, athletic corner and might become corner number one for the Cats, Cedrick Dort battled with Bryce Oliver and Oliver bested him a couple of times. Echols and Dort is a solid, athletic combination at corner that Kentucky can feel confident about. Outside of those two, the position gets thin. The once highly-touted recruit Stanley Garner could be ready to make an impact, but that is uncertain. Jamari Brown and Quandre Mosely will need to improve to get to that spot. With more talent arriving in the summer, the Wildcats will need to find who can backup Echols and Dort. If the spring game taught us anything, it is that Kentucky will be a much more aggressive team this fall than they were last fall. I believe offensive coordinator Eddie Gran will build the offense around Wilson, which will benefit his play style much more than when the offense was built around Snell. Wilson will be able to find more of a rythym in his game with a faster, more aggressive offense. He has the personnel around him to do so. I think you will see this on the defensive side of the football as well. Kentucky will have inexperience, which can make Mark Stoops and Defensive Coordinator Brad White dial up more creative blitzes and coverages to trick the offense. Last year, the experience and talent in the defense made it simple for the coaches to stick to the same schemes because they were good enough to win like that. With the inexperience on the outside and White taking over as DC, the schemes will become more aggressive. Kentucky will be a much more explosive team in 2019.